Our SPARK Fireplace installation is the heart of our house. It is the focal element of one large room. The SPARK fireplace divides the large room into four distinct spaces- creating a unique perspective from the family room, dining room, kitchen and sitting area. It’s completely open on three sides allowing people to be intimately close, wherever they choose to sit. The mesmerizing flame and the warmth generated from the Spark Fireplace allows one person or many people to enjoy the installation. 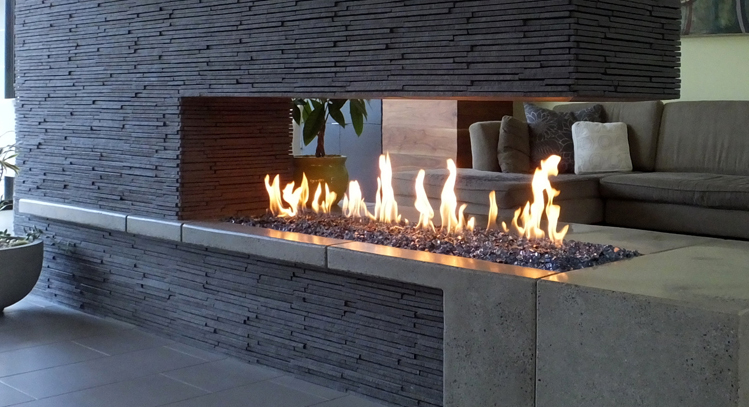 The SPARK fireplace is the focal point upon entry to the house due to its unique style and use of materials. It has a polished, concrete base with Japanese, INAX dark gray interlocking tile. The fireplace has a decorative niche for tall African sculptures, painted white to provide a contrast to the dark gray tile. The collective features of the fireplace play a strong role in reinforcing all elements into one cohesive room we call home.